A Chimney sweep from the age of 15 years, the orphan Peter Friedhofen and, upon the death of his brother, kept the widow with11 children. Like all the craftsmen getting to Germany. He founded works for the poor and sick. And in 1850 the Brothers of Mercy of Mary Help of Christians. He died in Koblenz in 1860 aged 41. Roman Martyrology: At Koblenz in Rhineland in Germany, blessed Peter Friedhofen, religious, who was first a chimney sweep, then founded the Congregation of the Brothers of Mercy of Mary Help of Christians, for whom he had to bear with gentleness and serenity of mind ridicule and harassment. If there is a patron of chimney sweeps, Blessed Peter Friedhofen could certainly be appointed, notwithstanding that he was also a founder of a religious congregation. Peter was born in Weitersburg at Vallendar (Koblenz) in Germany, Feb 25, 1819, sixth of seven children of Peter and Anna Maria Friedhofen Klug. He was a year old when his father died and at nine years old was also orphaned of his mother; the children remained in a state of total abandonment and poverty, so that the City of Vallendar had to assume the burden of their care. A good woman in the country took care of three children, but due to poverty Peter was not always allowed to attend elementary school. At thirteen, after receiving his First Communion, he followed in his brother Jacob’s foosteps, becoming a chimney sweep; because of his seriousness and competence, in 1842 at 23 years, was hired by the city of Vallendar as a master chimney sweep. Struck by religion, the youth of the country began to gather in separate groups, boys and girls; reawakening associations S. Luigi, creating new orders and writing the Statutes therefor. He sang Marian songs on rooftops and called the boys who gathered in the street, to join him at least for the chorus. He remained a chimney sweep only three years, because a long illness made it impossible to continue. In 1845, when he was 26, for a short period he visited the novitiate of the Redemptorists to Wittem in Holland, was very impressed by the fervor under which they lived there and began in him the love of the cloister; he probably would have remained at Wittem, but on October 27, 1845 his brother Jacob died, leaving ten children and pregnant wife. He could not abandon them to poverty, and despite being fired, the town of Ahrweiler hired him as a chimney sweep instead of the deceased brother, despite his illness. 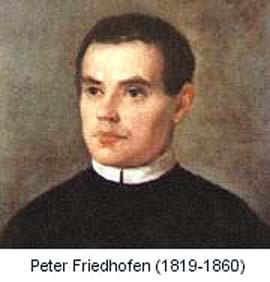 Peter Friedhofen continued to promote among young an assiduous frequency for the sacraments, reaching base for this purpose an association dedicated to St. Louis Gonzaga. The Bishop of Trier accepted him on July 2 ,1847 with a delegation and approved the rule of life, which Peter had written. Meanwhile he met the priest Antonio Liehs, secretary of the bishop, who became his spiritual director, and through him, had relations with the bishop. He tried in 1848, after obtaining a gift in a Weitersburg land, to build a house to fulfill his religious desire to help the sick. The Bishop of Trier, William Arnold, who now knew him, believed that Peter was the right person to restore the Order of Celli, religious nurses, also known as’ Brothers of Mercy ‘; together with his companion Charles Marchand, to spend their novitiate year at the cell Aachen, to learn their way of life as religion and assist the sick. The Order of Celli, so called in reference to the cells of their convents; arose in the fourteenth century in Flanders, as a religious order of lay brothers, dedicated to works of charity, especially during the black plague. In the seventeenth century took their final name of ‘Alessiani’, by the head of the main church of Aachen, s. Alessio; in the eighteenth century the Order declined, until it was reformed in Germany in 1854 and approved by Pope Pius IX in 1870. But his joy of being in his house “poor but clean”, lasted little, because his companion Charles Marchand, began to protest, because Peter lacked the education needed for higher education, then another Aachen Brother came to take the post. On February 15, 1851 Peter moved his headquarters in Koblenz, the beginnings were harsh, but he found the parroco De Lorenzi, a generous, good, spiritual and economic assistance for themselves and for the opera that was taking shape. On March 25, 1851 he received the habit and finally on February 28, 1852 the Bishop of Trier, Arnoldi, decreed the canonical erection of the new institution of “Brothers of Mercy of Mary Help of Christians”, the suit was to be one of the Brothers of Mercy of Aachen ; he authorized the issuance of the votes of Peter and a companion, gave members a rule of life, settled their purpose in helping the sick, naming the above-mentioned parish priest of Koblenz, Filippo De Lorenzi, their top cleric. With the help of De Lorenzi, from the Rule of Celli, Peter Friedhofen composed the Rule of the new congregation, the number of brothers multiplied rapidly, as well as the number of those assisted in the hospital and home. While its founder still lived, the Institute spread beyond that in Koblenz, in Trier, Kylburg, Luxembourg and then to America, Asia, Africa and Rome. Peter was from March 14, 1852 ‘top’ of the Brothers and remained in that capacity until his death. The health of Brother Peter, however, was not good, since 1843 he suffered a serious lung disease and every winter since 1857 could no longer visit the brothers outside Koblenz, so he had to write seven letters Circular, which combined a Spiritual Testament, he tried to transfuse with these writings in Brothers, his contemplative spirit, because he was convinced that we can not make an effective apostolate without holiness. In the early hours of December 21, 1860 he died a saintly death in Koblenz, a large crowd attended his funeral: Empress Augusta had put on the tomb of humble chimney sweep, a large stone cross. On July 27, 1928 his remains were transferred to Trier, in the Chapel of Mary Help of Christians, he was beatified by Pope John Paul II on June 23, 1985. He was a Chimney sweep from the age of 15 years, the orphan Peter Friedhofen and, upon the death of his brother, kept the widow with11 children. Like all the craftsmen getting to Germany. He founded works for the poor and sick. And in 1850 the Brothers of Mercy of Mary Help of Christians. He died in Koblenz in 1860 aged 41. This entry was posted on Sunday, December 21st, 2008 at 1:58 am and is filed under Beatified by John Paul II, Catholic. You can follow any responses to this entry through the RSS 2.0 feed. You can leave a response, or trackback from your own site.